On Thursday, June 20, after facing extreme political pressure from both parties, President Trump signed an executive order to end his administration’s practice of separating children from their families as they cross the border. However, the administration has no clear plan to reunite the more than 2300 children who have already been taken from their families. In fact, many of the separations could be permanent. The humanitarian crisis at the southwest border is drawing much-needed national attention and resources, and it has many Richmonders wondering how recent changes to immigration policy and enforcement are affecting our local communities. According to the American Immigration Council, more than one in eight Virginia residents is an immigrant. One in six Virginia workers is an immigrant, and immigrant-led households in the state paid $6.7 billion in federal taxes and $2.7 billion in state and local taxes in 2014. “The sentiment in our community is increased fear and uncertainty,” said Tanya Gonzalez, executive director at the Sacred Heart Center, a hub for Latino communities in Richmond that focuses on education, social integration, empowerment, and success. “Members of the Latino community in Richmond have had an increased number of incidents of discrimination and harassment, ranging from things like being told not to speak Spanish in a public place to bullying in schools.” A recent report from Virginia police show hate crimes are up nearly 50 percent year-over-year in the state, including ten anti-Hispanic crimes. While Richmond has not yet seen the kind of sweeping, large-scale, military-style immigration raids that have taken hundreds of parents away from children in communities in California, Ohio, Tennessee, Iowa, and elsewhere, local immigration rights’ advocates have seen changes in our area and worry about what the future holds. The majority of immigrants living in Virginia are legally allowed to be here. More than half the immigrants living in Virginia are naturalized, and many more are eligible for naturalization. Over 10,000 Deferred Action for Childhood Arrivals (DACA) recipients live in Virginia. Fewer than one-third of all immigrants are undocumented, but it’s an issue that affects many families since nearly 100,000 children in Virginia who are legal U.S. citizens live with at least one undocumented parent. Therefore anytime parents are swept up in ICE enforcement raids, they’re often leaving behind at least one child who is a U.S. citizen. One human example of the often arbitrary line between documented and undocumented immigrants is a Richmond mother named Abbie Arevalo-Herrera, a woman from Honduras seeking asylum in the U.S after escaping domestic violence in her home country. Threatened this week with deportation and now taking sanctuary in Richmond’s First Unitarian Universalist Church (information made public by her legal team), if she goes back to Honduras, she will be leaving behind her husband and two-year old son, both legal U.S. citizens. Although she is fighting for herself and for domestic violence survivors everywhere, her future in Richmond is uncertain. 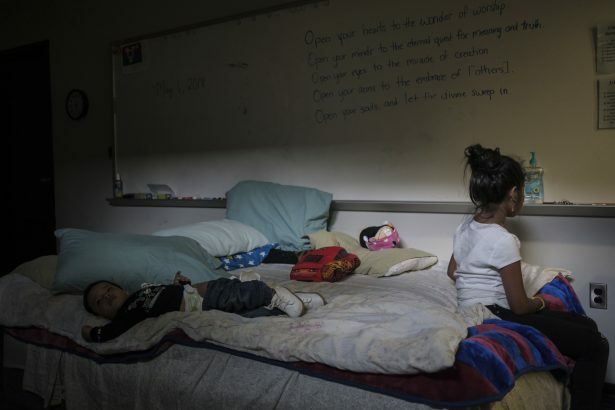 There are a number of national organizations dedicated to helping immigrant families at the Southwest border, but for people who want to help here in Richmond, here are a few ways to help. Central Virginia has a number of organizations dedicated to working to support immigrants while promoting equity, civil rights, and empowered, integrated communities. The following is a partial list. Donations allow LAJC to take on more cases and represent more people, providing equal and accessible justice for all. Volunteers to assist with clerical and administrative tasks. Sacred Heart Center (SHC): SHC is a community hub for Richmond’s Latino community, and offers a variety of educational and human service programs to individuals and families, including educational opportunities for adults (including GED, ESL, computer, and leadership classes), programs for youth and children (including school readiness, school enrichment, summer camp, parenting classes and more), and strategic community partnerships (that help with food assistance, health care, support groups, tax preparation, and more). Monetary donations to their Family Protection Project, which seeks to prevent the separation of local families by offering low-cost or pro bono immigration services, assistance locating loved ones who have been lost or detained, and volunteer training. Volunteers: opportunities range from cleaning to tutoring to photography to teaching ESL. Nonperishable food items for the Bainbridge Ministry Food Bank, open Monday through Friday, 9:15 am to 12 pm, Monday to Friday. Central Virginia Sanctuary Network (CVSN): A project of the the Virginia Interfaith Center for Public Policy, the CVSN is made up of interfaith congregational and organizational members, as well as individuals who volunteer through the Circles of Protection. Member commitments range from commiting to host guests facing deportation to supporting that work through fundraising, accompaniment, and hospitality. Monetary donations to the Sanctuary Fund, which provides for people fighting detention or deportation while in Sanctuary, and also covers bail and legal defense. Volunteers: CVSN is looking for congregations and individual drivers (to take undocumented people who are not eligible for driver’s’ licenses to appointments), writers and communications professionals, legal resources, outreach, hospitality (arranging meals, entertainment, visitation, and counseling), accompaniment to court hearings (which often protects people from detainment), and other tasks. Virginia Coalition for Immigrants Rights (VACIR): VACIR is a multi-racial and multi-ethnic coalition of organizations that exists to win dignity, power and quality of life for all immigrant and refugee communities. VACIR gives grants to other organizations, often to small and under-resources local organizations who mobilize quickly to do rapid response in emergency situations. VACIR has supported naturalization clinics, “know your rights” seminars, and DACA assistance programs. Monetary donations to fund member organizations initiatives. Protests: There are a number of upcoming protests around Virginia aimed at fighting unjust immigration policies, advocating for reuniting the 2,300+ children who have already been taken, and ending the zero-tolerance policy that criminalizes and detains families. Call your Senators and Representatives: Ask them to support common-sense immigration reform and insist on reuniting separated families. Check out Indivisible’s Guide on what to ask for when calling Republicans and Democrats. Be an ally to local immigrants. Here’s how. Use your privilege. If you’re not sure what that means, start here. Elect, donate to, and work for people who hold views on immigration that you support. Vote in every election that you can. Volunteer to canvass, phone bank, and drive people to the polls. Give money. In Virginia, Tim Kaine is up for reelection against Corey Stewart, a neo-confederate candidate for U.S. Senate. In the 7th House District, which covers much of the Richmond area, newcomer Abigail Spanberger is challenging incumbent Dave Brat, a Republican who has a strong anti-immigrant platform. What else are we missing? Leave your comments if you have other ideas to support and defend immigrants in RVA.